BOROUGH PARK – At five years old, many kids grab a hairbrush, use it as a microphone, and sing in front of the mirror. When Shaheen Pasha was five, she grabbed a hairbrush, used it as a microphone, stood in front of the mirror, and reported from Moscow. She didn’t even know where Moscow was. Pasha, a journalist, and a professor, currently lives in Amherst, Massachusetts. Before that, she lived in Dubai. She’s lived in Cairo, in New Jersey, and in Pakistan. But she was born and raised in Brooklyn. She still calls herself a Brooklynite. We first learned of Pasha through her incredibly powerful writing about the time a woman saved her family from homelessness in Borough Park and finally coming out about her late father’s mental illness – a bit of a taboo in many immigrant communities. She is working on a memoir about the immigrant life in Brooklyn in the 1980s. This daughter, wife, and mother to three children, was born in Flushing, Queens to parents who’d immigrated from Karachi, Pakistan. She lived in Borough Park until she was 11, and then moved to East New York. 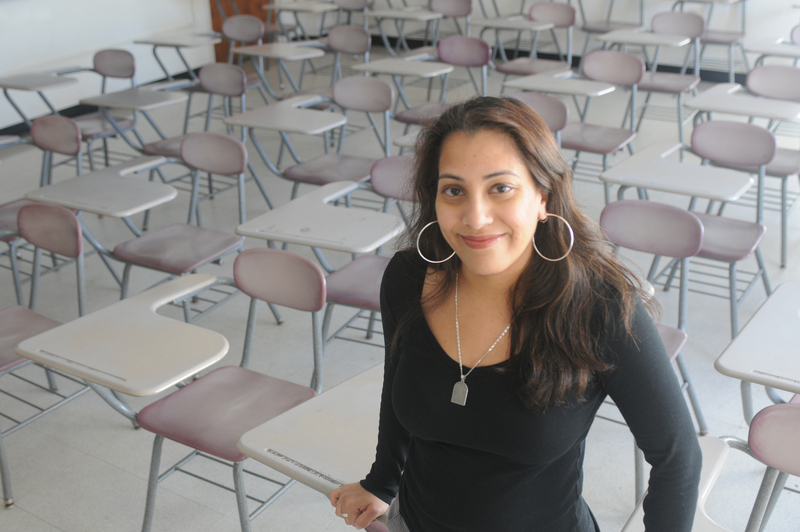 She attended P.S.131, Brooklyn Technical High School, and her alma mater is Pace University. Her hangout spots? “I was from a Pakistani family so my hangout spot was my home,” she laughed. In all seriousness though, her family would go to Kings Plaza Mall and Jacob Riis Park. “For Decades, Shame Kept My Dad’s Schizophrenia Secret from our Pakistani Immigrant Community,” is a compelling story addressing the lack of discussion on mental illness in the Pakistani community, and also the hardest story she has ever written, she says. Pasha’s father died seven years ago. He had schizophrenia, a mental disorder that affects a person’s ability to think, feel, and behave clearly. For a long time, it was something her family never spoke about. “What would people think? What are they going to say? They’re not going to like us,” was what her mother said after reading her story. Before she wrote the story, she asked her mother and siblings what they felt about it and whether or not they were okay with it. All three of them gave Pasha their blessings. But when it was published, it hurt her mother a lot. Surprisingly, Pasha received tons of support from readers and many of them told her stories of their mother, father, or siblings having a mental illness. Though this story was published after “Searching for the Woman Who Saved My Immigrant Family From Homelessness,” time-wise, it takes place before it. “In this time of Islamophobia and hatred, I needed to understand what made a white stranger open her home to us,” she wrote. When Pasha’s mother realized she needed support, as her father wasn’t well, her family moved to Pakistan. “We were struggling anyway. The American Dream hadn’t worked out for us just yet,” she said. When they moved to Pakistan, it became very clear they were not able to fit in. They didn’t speak Urdu very well, nor could they read or write it. “We were too American,” she said. So after six months, her mother brought them back, leaving her father in Pakistan because he had become very ill.
“She figured she was going to settle down, find a job, and then bring her husband back,” Pasha said. But when they came back to the US, they had nothing. No money, no job, and no support. And that’s what led them to be homeless in 1984– until a white woman took them into her home. What prompted her to write these two of the hardest stories she has ever written? “It finally came to the point where over the last couple of years everything that has been happening in the country sort of made me realize that we need to have these stories out there because these are very, very pure American stories,” she said. Thinking about it from the perspective of the Pakistani community, Pasha felt that these vulnerable stories especially need to be told. She also felt like personal stories about struggles were dying out. Pasha’s children were born in the US and have never been to Pakistan. She feels like it’s more important to show people where their roots are and what their parents went through to come to America. Though not an immigrant herself, Pasha very much identifies with the immigrant struggles. Pasha is also very vocal about the #MeToo movement. She has spoken about it in lectures and ties in race and culture, as she believes both are important to address, especially in the Muslim community. In our interview, she briefly discussed Tariq Ramadan, a Muslim professor teaching contemporary Islamic studies in Europe. He is being investigated for sexual assault. Just a few weeks ago, an anonymous Pakistani woman went to Facebook to write about a sexual harassment incident she experienced during Hajj, a spiritual pilgrimage Muslims make to Mecca, Saudi Arabia. This prompted many other Muslim women to come out about their experiences in mosques and Hajj/Umrah (a lesser pilgrimage to Mecca), resulting in the #MosqueMeToo hashtag on social media. But this isn’t only an internal problem amongst Muslims, she said. Anytime a Muslim woman comes forward with her experiences, everyone from the “outside community” reacts differently than when a non-Muslim woman comes forward. To end the awful rhetoric, people need to be willing to engage with the community, and that’s especially important for those who have the ability and platform to do it, she says, believing it’s essential for her to speak out as a journalist.